Love Monster Lulu’s scaring up snuggles! But with no one around, who’s left to cuddle? Lulu, the Love Monster, is sad when she can’t find anyone to share her love with. Her mother and sister give her the comfort she needs in this sweet story showcasing the importance of family. Review: Love Monster Lulu is a cute short story. Lulu is in need of some hugs and kisses and can’t seem to find any. Lulu finds exactly what she needs when her mother and sister find her crying. Hugs and kisses are magical in Love Monster Lulu. 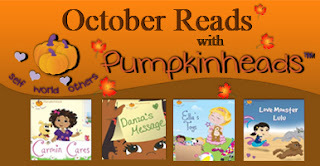 Note to Parents: Pumkinheads has a wonderful interactive site for your little ones to explore, visit and enjoy. 2 Winners will take home a set of all four books in the Pumpkinheads series.